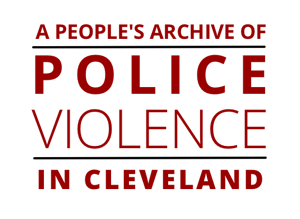 A People’s Archive of Police Violence in Cleveland (referred to hereafter as the "Archive") aims to provide a sustainable, autonomous means for Cleveland citizens to share their experiences with or commentary on police violence. In granting this permission, you warrant that you are 18 years of age or older and have the full power and authority to consent to this agreement, that your submission does not infringe any existing copyright or contain any libelous matter, nor invade any third-party rights of privacy or publicity. If your submission does contain libelous or slanderous matter, you understand that you may be subject to legal action. You further agree to defend and hold harmless the Archive, its hosted website, its volunteer members, and ancillary groups and their employees against all claims, demands, costs, and expenses including attorney's fees incurred for any and all claims of copyright infringement or any other legal or regulatory course of action arising from the use of your material. The Archive has no obligation to use or publish your contribution. You retain ownership of and copyright in the material you share. By submitting your contribution, you grant a worldwide, non-exclusive, royalty-free license to the Archive to preserve and make your work accessible via the Archive's website. This permission includes the right to modify your material to conform to the goals of the Archive, to reformat it as necessary to preserve its perceptibility and usefulness, and to make it available for educational, research, promotional purposes outside of the project, in perpetuity and in all media formats. This license does not authorize exploitation of your contribution for profit or commercial use. Content is related to police violence in Cleveland. Metadata submitted is deemed to be accurate and free of libelous statements by the administrator. Users have the right to submit content and submission does not infringe any existing copyright. Content does not provide personal information of the contributor or any other individual, including addresses, phone numbers, etc. Content does not endorse any commercial product. Content does not pose a risk of damage to the network, computers, or servers of the Archive. Your submission to the Archive is covered by a Creative Commons Attribution NonCommercial 4.0 International Public License. By using one of our public licenses, a licensor grants the public permission to use the licensed material under specified terms and conditions. If the licensor’s permission is not necessary for any reason–for example, because of any applicable exception or limitation to copyright–then that use is not regulated by the license. Our licenses grant only permissions under copyright and certain other rights that a licensor has authority to grant. Use of the licensed material may still be restricted for other reasons, including because others have copyright or other rights in the material. A licensor may make special requests, such as asking that all changes be marked or described. Although not required by our licenses, you are encouraged to respect those requests where reasonable. The Archive is not positioned to grant licenses to or approve requests from third parties to make use of content in the collection. Contributors may elect to display contact information, and it is the user’s responsibility to obtain any necessary permission from the copyright holder(s).